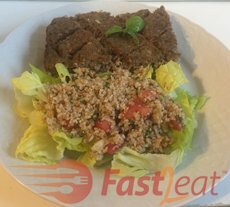 Kibbeh (pronounced kee-bee and also spelled quibe, kibe, kibbe, kebbah, kubbeh, kubbah kubbi or kobeiba depending on region) is a dish made of Bulgur (cracked wheat), minced onions, and finely ground lean beef with mint, basil, cinnamon and optional spices. It can be optionally stuffed with mozzarella, provolone or cream cheese (Catupiry in Brazil). This recipe has been adapted from the one my Godmother Regina Alfradique has sent to me and there are several ways to eat. The football-shaped deep-fried (or also shaped into balls or patties), baked in a casserole dish (my favourite way), cooked in broth, or just served raw with olive oil. Kibbeh is a popular dish in Brazil and Middle Eastern cuisine. Most Brazilian kibbeh uses only ground beef and not other types of meat but in Middle Eastern, they also use lamb, goat, or camel meat. Serve warm, accompanied by a fresh salad and/or with this delicious Tabule. Get personalized meal plans with recipes and shopping list in minutes. Save time & be healthier Immediately!